11 Fitness & Lifestyle Blogs you can use …..
Do you need some inspiration to get valuable messages down to your staff and clients? Or do you have writer’s block and need some subjects/material to be able to inspire you? 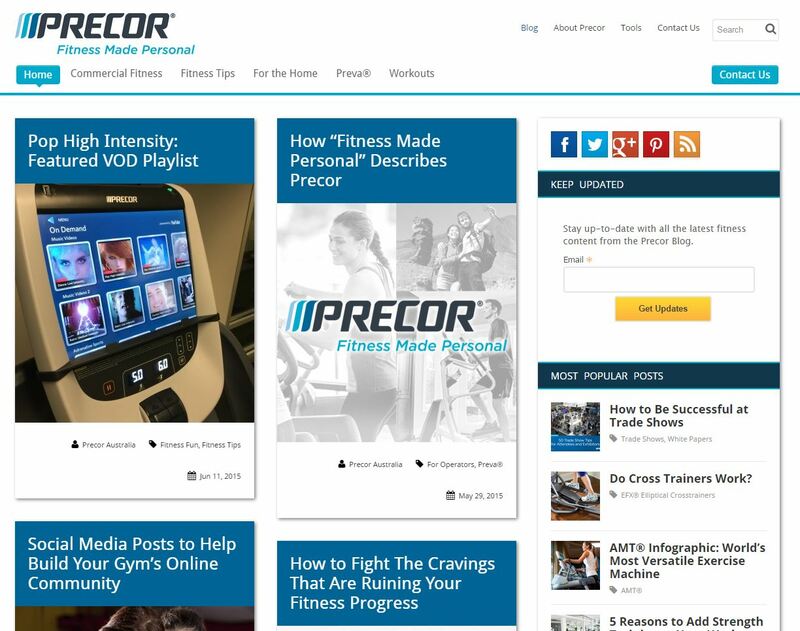 Here are 11 Fitness Blogs that give you a range of styles & information that we think are a good starting point (in no particular order)..
Let us know if there are others that you find value in. Remember: Online Etiquette = always reference the author’s work & hyperlink to their blog (it’s good for your SEO anyway). An inspirational and down to earth blog, Fitness food and style is run by Dani Stevens. Juggling four kids, a career and a blog, she shows us how at 40 years of age she keeps an active lifestyle. We especially find the Transformation Tuesday stories inspirational and beneficial for your members. This blog motivates, inspires and empowers everyday people to get fit, and is rich in general information which can be passed onto your staff. Fitness machines aside, the information that can be found on this site, is useful for all people interested in getting fit. The information covers a range of potential readers,l including information for gym owners. Well laid out and easy to navigate, there is information here for everyone. This is a good example of what an organisation’s blog should be like. Yes, there are a lot of other organisations doing as well as this one, but we like the layout of the blog, good clear picture, consistent branding, bio on author of each piece and helpful information no matter what your motivation is. Do you know of other great business blog examples? Let us know. This one is a must for all PT companies in the world. Self-described, ‘the collection of the brightest and most cutting edge PT in the world’. Chock full of information for anyone interested in fitness, or running a PT business. This is for the more serious fitness people out there; especially if you’re a competitor. Coming from a Melbourne based PT Company, led by Mark Ottobre, it’s a great example of picking your niche in the industry and sharing information on that space. Included for its Blogs and Podcasts about nutrition, this blog shares some really interesting information around changing societal perception of what is considered healthy to eat. This is also a noteworthy blog for its layout and navigation. It features a handy menu on the right-hand side for easier navigation, good layout and useful information that your clients and staff can use/discuss. Here’s an American blogger that is going at the blog concept in a different way. Instead of the well-worked, self-promotion style, it has a nice looking layout that features a wealth of instructional photos demonstrating exercise techniques. The blog features workouts, recipes, running, style beauty, health &fitness and lifestyle articles, its well-constructed and informative. Brad Schoenfeld is known as ‘The Hypertrophy Specialist’ and his style is reflective of his academic training. If you’re big on scientific styled information this is a good site to reference. Here is an aggregated collection of 50 bloggers (for the most part North American) that provide information from a whole range of angles in the health and wellness space.